Is looking at your ceiling giving you the inspiration for your next DIY project? If you want to remove that ugly popcorn texture immediately, then it is! If you’ve also heard this is an easy thing to do, then you’ve heard right. 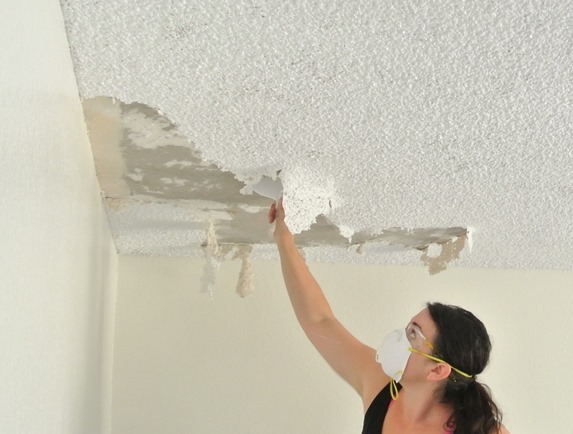 The process does create a mess; however, with a little preparation (and our help) you can tackle that popcorn ceiling – no problem. Ready to get started? Popcorn ceilings and acoustical panels were all the rage in the 60’s and 70’s, but today they are a turn-off to potential home buyers. They can be used to hide flaws in the drywall but they collect dust, which may aggravate allergies. The biggest drawback is popcorn ceilings installed prior to 1979 often contain asbestos and will need to be tested. These ceilings are only dangerous if disturbed, which is why professionals need to remove them. Prepare the room – Remove furniture and light fixtures; lay plastic over walls, floors and doors to contain dust and debris. Wet the ceiling – Spray water lightly over small sections of the ceiling to soften it up and make it easier to remove. Scrap it off – Use a texture scraper for larger areas and a putty knife for corners and trim. Sand the area – To remove any remaining lumps, sand the ceiling and then run a damp sponge over it to remove dust and debris. Allow to dry. Make repairs – Redo any failed joints and edging tape with drywall mud. Fill in cracks with spackle. Lightly sand again. Prime and paint – Use a bright white ceiling paint to help reflect light in your room. This stuff is like wet oatmeal that dries into annoying drywall dust, so unless you want it to get into everything, hang and lay plastic drop cloths. Overlap and tape all the seams. It may seem like overkill but when done all you do is remove the tape, roll the plastic up and stuff it in a trash bag. If you have moistened the ceiling enough, the popcorn material will scrape off easily. You may have to spray it a couple of times because the texture is dry and porous. Don’t overdo it or the drywall can be damaged when you scrap. Go slowly and work in small sections. A ceiling texture scraper is good on large spaces and often comes with a refuse bag to collect popcorn debris. To remove popcorn from tight corners and around molding you may want to use a putty knife. Once the ceiling has dried lightly, sand it and vacuum up the dust. Are You Ready for Some Mud in Your Life? Prepare to do a little drywall work when removing a popcorn ceiling. Many installers will do a basic/rough taping of the drywall if they know it is to be covered with popcorn texture. For a smooth surface, put a skim coat of drywall mud on the joints and sand lightly. A large room can be a tough workout for someone with a bad back or neck, so consider rounding up some helpers or hire a professional. Yes, this is an easy DIY project but only if you prepare your room first. Take your time, do it right and save the popcorn for a bowl in front of the TV. Once you finish removing the popcorn ceiling, do you need some advice on painting? Our blog, Paint Like a Pro – Tips for Painting Your Ceilings and Walls, will help you achieve beautiful results. From tank sprayers and wet/dry vacuums to paint sprayers and drywall tools our expert staff is always on hand to help with your next DIY home renovation project. As always, if you have any questions about pricing or how-to’s, don’t hesitate to contact us. Stop by our store — we’re open seven days a week.